40A - 4-10A-Banks - 12V-48V. Our customers asked for a series of chargers that were smaller, lighter and economically affordable. 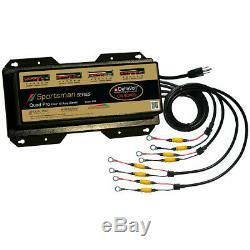 The Sportsman Series of chargers answers these needs. This line of chargers is designed for all types of battery applications. Sportsman chargers have all the safety and reliability features that have made PRO Charging Systems chargers the #1 choice of most boat manufacturers, dealers and over 750,000 customers across the country. Advanced microprocessors and LED readings make the units even easier to use. Battery Charging System Designed for Use On Land and in Fresh and Salt Water. The Green Charger: Totally Repairable Not a Throw-Away Unmatched Performance, Reliability, Safety and Quality TROUBLE FREE Just Plug It In and Forget It! Join Over 750,000 of Our Satisfied Customers! Fully Automatic and Totally Waterproof. Approved for Wet Cell and AGM batteries Models also available for Gelled Electrolyte batteries Designed for use in fresh and saltwater DeltaVolt® Intuitive Charging Technology Waterproof, dependable, rugged construction Independent outputs Fully automatic / multi stage charging Zero spark technology Battery maintenance mode On-board diagnostic codes Temperature compensated Advanced microprocessor controlled Battery systems available: 12V 48V LED lights indicate the state of charge Reverse polarity protected No installation restrictions FCC Parts A & B interference compliant DC charge cables = 5' AC power cord = 3'Approved and meets ISO 8846 Marine standards Ignition protected US Coast Guard 33 CFR 183.410. May be used in many types of sporting applications including. Inland Watercraft Salt Water Watercraft Motorcycles Golf Carts Utility Vehicles. Prices, specifications, and images are subject to change without notice. The item "Dual Pro Boat Marine Sportsman Series Battery Charger 40A 4-10A-Banks 12V-48V" is in sale since Friday, February 22, 2019.